I grew up in a small Midwestern town, not too different from Smallville. I could always relate to the Superboy of the Silver Age. So when Jason Todd arrives in Appleton, U.S.A., intending to burn it to the ground, I have to wonder why. A town square, an apple festival – how more wholesome could it get? Well, when the entire town has murderous intent to the former Robin, maybe he has good reason. Jason is forced to take on the entire town, and then a slew of monsters reminiscent of Solomon Grundy, but without the charm. They’re also way harder to kill than one might think. Yet the Red Hood – cuz while he was unconscious someone put him in his costume – manages to make headway in that regard. Which only opens the door for the appearance of this issue’s special Bat-guest star. Red Hood has always been an anti-hero, remaining just enough in the light to keep the more pure heroes at bay. But with the change in title and costume, he’s moving more into darkness. I hope it continues. I like the idea of a former hero going bad enough that he has the likes of Flash or Green Arrow to deal with. Not the whole “framed-for-a-crime-he-didn’t-commit,” that’s been done to death. What is refreshing is to hear the hero say, “Yes, I did it. I’m guilty.” And then attempt to claw his way back toward redemption. I like the turn this series has taken. 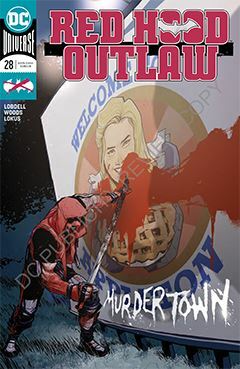 In its former incarnation – Red Hood and the Outlaws – the outlaws in question were a thinly-veiled reference to the Big Three. I would have preferred to see him take up with some actual super-villains (Kinda like Batman is doing).